'Twas Mummy Killed The Beast! Walking down the New York "back lot" we come across the new Museum of Antiquities which in reality is the fa�ade for Revenge of the Mummy- the RideSM. Like many of the rides at Universal, this attraction has three queue lines- a normal line, a single rider line, and the Express Pass line. For your first ride I would suggest using the normal queue line. If you choose the faster lanes (which you will want to do for re-rides) you will miss the pre-show video which sets up the storyline for the ride. The "documentary" sets the stage for the ride itself as it discusses the making of the new Mummy sequel which is being filmed on this "hot set". The "movie" deals with the conflict between the Med-jai (the force of good) and Imhotep (the force of evil). Unfortunately, some very strange things seem to be happening on the set. Is it cursed by Imhotep, the Mummy? The stars and crew don't agree, least of all Brendan Fraser who seems more concerned with trying to get a cup of coffee from a less than cooperative catering crew. A minor crew member named Reggie seems to be tied to some of the mysterious goings on, remember him though. 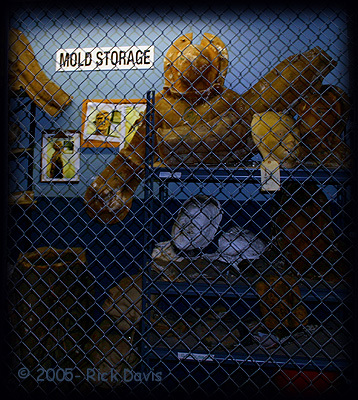 Supposedly we have been hired as "extras" for the movie as is evidenced by all of the trappings of a working set- cameras, props, molds, costumes, lights, storyboards, etc. we pass in the queue line on our way to the first of the actual "sets". "Death will come on swift wings to whoever violates this tomb"
Winding our way further on in the queue line, we encounter hieroglyphics filled walls as we enter the dimly lit burial chamber. Things from this point on become a bit confusing. Is this a set inside the "Museum of Antiquities", is it on location in Egypt, or did we somehow become characters in the movie and this is all "real" now? No matter, we must be concerned with the strange things already occurring. When we place a hand on the ornate brass hand symbol on a burial vault in the middle of the room, the lights begin to pulsate and the sound track changes slightly. Further ahead we encounter a frame on a column that circles a dark piece of glass; that is until we touch the back of a giant jewel like scarab just below it. An image appears before our eyes in the frame. We are now seeing into the future, so to speak, at the path ahead of us. Each time we push the button, an air jet blasts the guests crossing the wooden bridge ahead much to our amusement. But beware; we soon will cross that path ourselves. Turning the corner we see a hole in the chamber wall which contains a gleaming trinket that just begs for us to reach in and touch it. As we do we have two surprises waiting for us- It seems to vanish as our hand reaches in and a jet of air quickly prompts us to withdraw our hand. The second floor is of course the loading station for the ride. (It IS a ride, remember?) There are two sides to the loading station so while one is car is entering the ride, the other is being loaded. The ride operators are in character and in period costumes as they assist us into our vehicle and wish us luck, but you can tell they don't seem to think they will see us again. Our mine car moves silently forward into a new room past mummies (former tourists? ), and we notice a strange shadow crossing a stone stairway as we hear the voice of Reggie (now a baseball cap-wearing mummy) - "Are you insane?! Get out of here! The curse is real. This whole place is a trap. He's after your souls. Look for the Med-jai symbol; it's your only hope!" Suddenly, Imhotep bursts out of his sarcophagus, sucking the soul out of Reggie. "Silence!" he says. "With your souls I will rule for all eternity! ", but he allows us to pass. Our car again moves on and now enters the treasure room. Again Imhotep appears, this time behind the altar making this offering- "Join me and savor riches beyond measure" (as gleaming gold statues and other riches appear on all sides of us) "or refuse and suffer a more bitter treasure!" Suddenly, smoke and fire erupt as eight huge warrior mummies suddenly appear on both sides. As we hurry to leave the room, a huge stone wall begins to descend to block our path. We manage to get by it just in time. That was close! Unfortunately, we aren't safe yet. Our car slams to an abrupt stop just before hitting another stone wall. Scarab beetles literally pour out of the wall before us and begin crawling along the side walls: Just then, the lights go out. As we wonder when the bugs will begin to attack, the vehicle starts moving backwards, dropping down a slight incline. When it stops, we begin a slow 180 degree rotation and we get a glimpse of the Med-jai symbol just before Imhotep again appears to taunt us. Once stopped we find ourselves facing a giant image of his head: "Not even the Med-jai can save you now", he says. "There is no escape. Your end shall be my beginning." We suddenly are thrust through this image. "Your souls are MINE!" he screams. We are rocketed up a hill and into a thick patch of green fog. Just as we reach it, we make a very surprising sharp right turn and drop instantly. The slow paced ride has been replaced by roller coaster ride in which we fly by a variety of apparitions at a frantic rate as we are tossed side to side and up and down. Much too soon we find ourselves braking to a halt at the unload station. The silhouetted figure of a female ride operator is visible in the booth as she thanks us for riding and wishes us a great day at Universal. But something isn't quite right; the lap bars are still locked. Before we can wonder why, the ride operator seems to vaporize in the cloud of smoke and bright light that envelopes the control booth. Shattering glass hits us (a water spray actually) as Imhotep now appears from the broken glass window. "Prepare to forfeit your souls!" he yells as very real and very hot, searing flames ignite the ceiling. "Death is only the beginning!" He is not done with us yet! 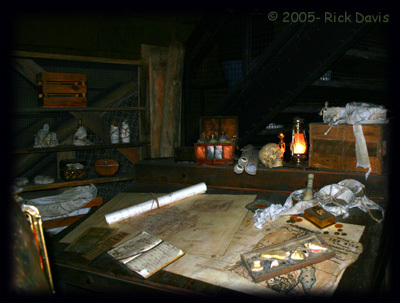 Thanks to Leonard Pickel (publisher of Haunted Attraction Magazine and DAFE member), who organized a last minute Mummy event, I was able to get an idea of some of the Mummy's secrets. The original plan was for an after hours normal ride, a lights on ride, and a behind the scenes look at the scenes, followed by dinner at Lombard's landing as part of the event cost. As things sometimes happen, the behind the scenes look was canceled by Universal and no on-ride photos were allowed, so I am sorry to say you will have to settle for a thousand words instead of one picture. 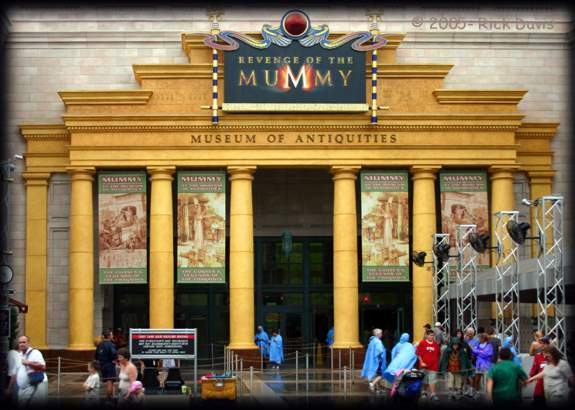 As you know, Revenge of the MummySM- the Ride is located in the former Kongfrontation ride building. The motivation to replace the old ride was two-fold- Kong was beginning to show its age (built in 1989) and the park needed to improve "traffic flow management" in the park. In other words, they needed a new attraction that would cause part of the crowd to go to the relatively slow back-lot area and spread the crowd more evenly around the park. Thus the 70,000 square foot building was gutted and a $40 million project began. Most projects of this type at Universal require at least a 3-4 year lead time and Mummy is no exception. Soon after the 1999 release of the first modern Mummy movie, Director Stephen Sommers approached Creative Director John Murdy with the thought of creating a Mummy ride for Universal. While most projects of this type begin with a "napkin sketch", it must progress in stages including concept, design, illustrations, story boards, and a lot of guessing at where technology will be a couple of years in the future when the ride is being built. There is one last planning stage- a reality check. Once all the ideas are on paper the engineers must then decide what realistically can be built. At Universal, most of the concept, design, basic architecture, scenic and set design, technology, and engineering concepts are done in house while the outside firms are used for the specialties. Set building, lighting, audio, video and fabrication are also outsourced. The design of this ride began with the collaboration of Stephen Sommers, Alan Cammeron (Production Designer), and Bob Dusay (producer/editor) with Allan Silvesti providing the musical score. 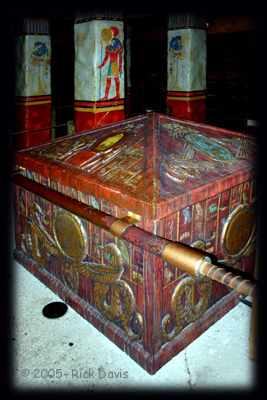 Research for the ride included aid from London's British Museum and leading experts in Egyptology to ensure the authenticity of the scenes. While the ride was under construction, the core staff of the ride was involved to get their input for an operations viewpoint throughout the project. The operations staff began their training in January of 2004 to prepare for the May 2004 opening of the ride and was also tasked with working out any "bugs" by running the ride continuously. The buildings audio system uses 200 speakers and produces 18,000 watts of audio. The ride's effects are triggered precisely on time with the aid of sensors and a computer that takes each car's weight into account to calculate the timing. Approximately every 24 seconds the ride's power requirement is a 5 Megawatt spike, roughly the power consumed by 1000 houses. There are 13 ride vehicles in the attraction, 11 in operation, 1 spare, and 1disassembled for inspection and refurbishment. The ride can have 5 cars running inside the attraction at one time. The 16 passenger, 4 abreast, vehicles consist of 2 sections closely coupled to appear as one car in the dark sections, separating slightly to negotiate the roller coaster sections. The rear seat features a fold away side that allows people in wheel chairs to easily transfer to the seat. Each ride car contains a 350 watt digital audio system that uses 22 speakers. First Chamber- The main feature of this room is of course the Imhotep mummy. 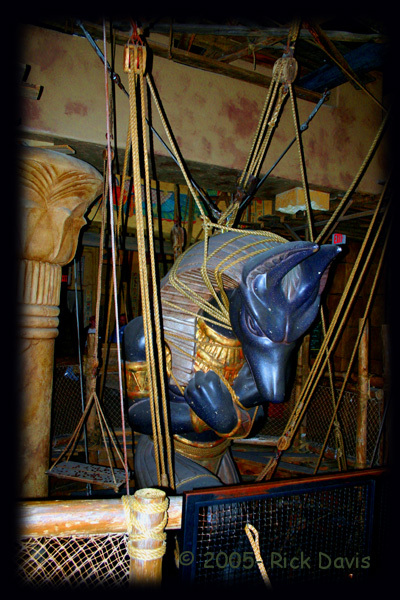 The 6' 8", 680 pound animatronic figure contains 1000 feet of 4000 PSI hydraulic tubing. He is capable of 80 motions and his hollow stainless steel arms could theoretically lift about 2,500 pounds. The state of the art "force feedback" algorithms allow for natural looking movement. Designers intentionally tried to not make him look too "lifelike" so guests would not think he is an actor! 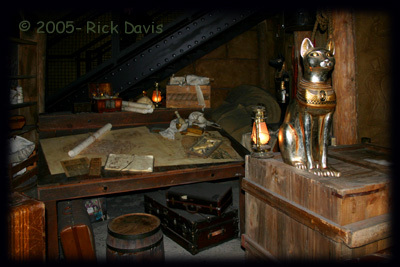 Treasure Room- More than 3,000 sheets of gold foil were used to cover the treasures in this room. Look for a tribute to Kong among the gold statues. 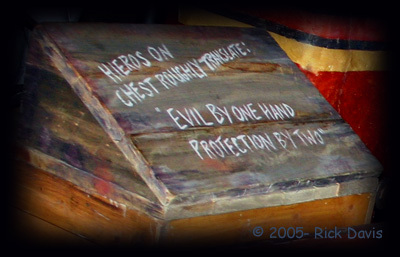 (Despite what people think they see in the ride; this is the only Kong reference in the attraction.) Each warrior statue weighs about 450 pounds. Scarab Room- Physical "bugs" pour out of a hole in the wall in front of the ride vehicle as more bugs (attached to scrolling canvases) appear to crawl along the side walls. The effect is enhanced by video projection systems. The room goes black to heighten the suspense as the car backs up. As the car enters a turntable, projections systems create an image of Imhotep that seems to follow the car as it turns. The Coaster Portion- Upon completion of the rotation, a projected image of Imhotep appears to surround the hill at the entrance to the coaster. The "lift hill" is approximately 25' and the LIM's launch the ride vehicle with 1- 1.5 G's of thrust for about 1.5 seconds. A cloud of green fog obscures the top of the hill masking the first drop and immediate right turn, guaranteed to shock and surprise first time riders. The maximum speed is about 45 MPH and the cars approach "zero G" on hills about 7 times during the ride. There are 25 "apparitions" that appear in the coaster section. Each flat, painted image is approximately 30" x 20". Artist Stacey Allen painted the original images which were then recreated in fluorescent colors. 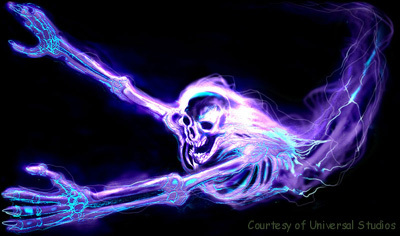 Each "apparition" is illuminated with low level black light followed by a bright black light strobe and then a white light strobe "explosion" producing a "burn in" effect in the rider's eyes. With the work lights on, all that can be seen, besides the track, are a few pieces of maintenance equipment. Sorry, no hidden Kongs here, despite what you may have heard. This Article ©2005 Rick Davis And Used With Permission. Photos © 2005 Rick Davis, and Used With Permission. Spirit graphic courtesy of Universal Studios.